Chicken Hearts, Meat and Myopathies | What's In John's Freezer? Here is a little vignette for you; a taster of the BBSRC-funded chicken biomechanics project my team has underway in collaboration with Jonathan Codd’s team at Uni Manchester. I did not know about the following situation until a couple of years ago during my former PhD student (now postdoc) Heather Paxton‘s research on chicken mechanics. 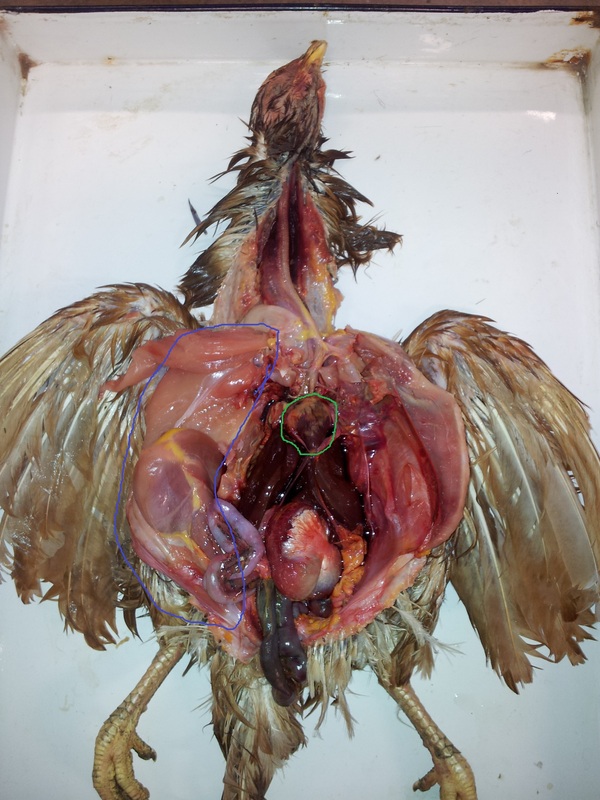 Regard this chicken, slit open along the midline to show the viscera. The huge pectoralis muscles (breast meat) have been pushed aside; the right side’s are clumsily outlined (I blame caffeine?) in blue. Then consider the heart, within the jagged, shamefully and ineptly drawn green circle. I’ll come back to that. So this broiler chicken took 6 weeks to reach this size, of about 3 kilograms (6.6 lbs). Fifty years ago, before artificial selection was imposed on a MASSIVE scale (many billions of chickens per year worldwide, bred in a complex pyramid scheme of crossed strains), that same chicken strain would have taken 15 weeks to reach a normal slaughter mass of roughly 2 kg (4.4 lbs). The major selection, of course, has been for edible meat, especially that lovely breast muscle’s white meat. If we look at red junglefowl, to a large degree the “wild type” ancestors of domestic chickens that are native to southeast Asia, the leg muscles take up about 7.7% body mass per leg vs. about 6.3% in the broiler. Just a small decrease, but probably an important one, and something our research focuses a lot on (walking ability, lameness, activity levels etc). But that’s a subject for a future post. In stark contrast, the breast muscles (back to the blue ellipse above) have gone from 7% to up to 11.6% body mass per wing; a huge change! Now let’s return to another large muscle, the one within the green circle above; the heart. Not only must the heart, which has become relatively larger by perhaps 25%, pump blood to a body that has enlarged by >50%, but it also must perfuse the giant pectoral muscles, which have enlarged by >65%. Herein lies the problem… You probably can predict what happens. While surely uncomfortable for the birds and hence a welfare problem, it is usually not found until the animals are slaughtered, and then of course the meat is destroyed rather than delivered for human consumption. Because of the welfare problems and loss of meat (i.e. financial loss), the poultry industry is trying to remedy this problem. W’e’re working on aspects of this as well, as part of our study of how the locomotor and ventilatory systems of chickens develop and have evolved. I am blogging this as a great example of how anatomy can go haywire and become imbalanced when evolutionary selection pressures are intense and highly specific (e.g. almost single-minded human selection for large breast muscle). It is also a conundrum that human society faces: while chicken meat seems more efficient and more ecologically sound than some other meats, and there is growing demand for meat as the human population grows, how do we balance welfare concerns with food security, economics and other factors? And how do we judge when artificial selection has gone too far? I do not present an answer because the answer is not easy, and because my team is still learning about how to answer it. Hmmm, I really enjoy your big animal dissections but this is bringing it home to the kitchen table, making it relatable. Really important work! Thanks Carol! I probably would never be doing this work if I didn’t end up as a Prof at a vet college. I’m immersed in animal welfare issues and discussions all the time and it has rubbed off. And in a remarkable way, the applied stuff I do with chickens and elephant/rhino feet all makes perfect sense in terms of my career trajectory and past work. Indeed, my tyrannosaur research directly led to this chicken work- I had an artist do an illustration of a T. rex racing a giant chicken, and poultry industry/research people saw that and saw the relevance to broiler chicken “leg weakness” problems, and off we went to collaborate! Now I enjoy the chicken mechanics science as much as I enjoy the dinosaur evolution stuff; it’s all one big happy, fun, enlightening assemblage of research. Thanks for your kind comments! I think Britain has long had a reputation for putting the welfare of animals first and I’m not surprised it has had an effect on your work. It’s amazing the longer you are in a field (a research field, not a literal field) how everything seems to tie in and come back and make more and more sense, and yet push you further. I’m so happy for you that you found such a great fit for your natural curiosity. Your world sounds like so much fun. This is really interesting because one might assume that the cardiovascular system would shift and evolve to meat the demands of the muscles in sync–or at least with some lag. I would have thought the muscles are squirting out VEGF and other growth factors to promote increased vascular growth at a plastic level at least. But maybe no?! Perhaps this the lag? Are we seeing constraint in action? Way cool. Have people made myostatin deficient chickens yet? Would they have a similar phenotype? Yes I think the lag is part of it; this is not a naturally evolving system by any means, and the constraints are pretty severe– selection for big breast muscles is swamping out everything, and then the biomechanical environment of those big muscles leaves little wiggle room for the heart to overcome resistance. Good question about myostatin-deficient chickens. I do not know! 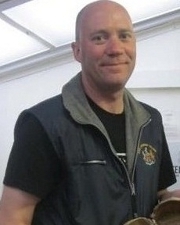 2) “.. of course the meat is destroyed rather than delivered for human consumption.” – Really? Because I would assume that would go to dog food. Or cow chow. Or something that makes a lesser profit, but a profit nonetheless. Do they really destroy it? Thanks Jenn- 1) sure, no question that some secondary traits have been dragged along; 2) I am sure it varies depending on country/company, but a lot is thrown away on the production line, probably due to regulations (e.g. FDA/DEFRA). Necrotic meat is not a good idea to serve anything, as it is often contaminated with various bacteria, fungi etc. I wonder if this problem is exacerbated in chickens and turkeys, with their light meat/dark meat segregation. They have so little myoglobin in the breast meat (or none at all?) that they are especially inept at coping with low oxygen tension in the muscle. Sounds like industrial chickens need just a *little* bit (or a bit more) myoglobin in their oversized breasts. Good question Lea! I do not know how much myoglobin would be needed to fix this problem or if that would even fix it (or how scientifically easy it would be to tweak it; given the vast populations the industry works with, that is probably not the trickiest obstacle). Moreover, the harder problem might be getting industry to change it. They work hard to understand what the public will buy– a slight change in breast shape or colour (i.e. from myoglobin in this example) can actually have a big effect on how the public likes a cut of meat and thus have an economic impact. With the numbers of chickens sold/year that the major poultry companies deal with, even a 1% change in sales rings up big $£ consequences. Granted, the welfare issues cannot be denied but these always come up against the economic issues. It is very interesting working in this area because of these constraints; very different from the other research I do, e.g. on extinct dinosaurs!